Jack Butala: Seller Signed & Mailed Back My Offer – What to Do. Every Single month we give away a property for free. It’s super simple to qualify. Two simple steps. Leave us your feedback for this podcast on iTunes and number two, get the free ebook at landacademy.com, you don’t even have to read it. Thanks for listening. Jack Butala here for Land Academy. Welcome to our “Cash Flow For Land” show today. In this eight part series, Jill and I talk about what to do when sellers begin to start calling you back based on the offers you sent them in direct mail. It’s a thing we talk about all the time. This is episode three of eight, it’s called, Seller Signed and Mailed Back My Offer, What Do You Do? Best Case Thing That Can Happen? Jill, great show today, great episode. Why don’t we start? Let’s take a question from a caller. Sure, okay. Scott from Denver asks, I’m unable to understand the merits of this “acquire as many properties as possible” approach when compared with the approach of purchasing just one or two properties per year or even one property every couple years or purchasing larger and nicer properties each time. Can you help me understand? This is so up your alley, Steven, I love it. Can you believe how smart some of these listeners are? We have really smart people in this, even in our members, it’s just … When we started all this I didn’t intend for this to … It’s good, it’s refreshing. Yeah, this is right up my alley. This is actually my business philosophy and Jill and I are slightly different on this. I’m a big fan of not negotiating … It actually parlays into the topic today. I’m a huge fan of really not negotiating the buy or the sell price. In fact, doing as little communication as possible. The result of that or the consequence or the result of that is you’re probably slightly paying too much for the property and slightly selling it for too little but you’re doing it way more often. It’s the age old concept of, “Yeah, we’re not making a ton of money on this deal or maybe as much as we can but we’re making it up because we do so many more deals because of this philosophy. In the past I’ve worked with people who just, they can’t, they could never digest that concept. In real estate specifically because … I’m not sure why but in real estate everybody seems to want to maximize price. Here’s the question that I would ask this caller. Would you rather make $20,000 on a deal that you’re flipping, a land deal that you’re flipping over an eight month period or would you rather make $5,000 in a week and then move on to the next deal and make $5,000, and $5,000, and on and on and on. That’s the way obviously Jill and I, you and I run our show that way. Scott from Denver, I’m sure that that answered your question. If it didn’t let us know. I was going to say too it’s I think scary holding out for that one home run deal. What if it doesn’t come along? It’s an interesting concept, I totally get what he’s saying but gosh. Sometimes I think, to add to what you said and agree, gosh the work that goes into that you could have flipped so many other things along the process for a lot less work, a lot less time, a lot less energy, and have these same results. Even worse case scenario, same result, you know? Yeah it’s, we’re doubling our money. Our business model … We’re not selling … This isn’t a 20% margin business and maybe it should be but we double our money. We buy properties. A typical deal for us, we buy a property for, I don’t know, $1,000 or $2,000, Jill, and sell it for four or five. Really, really, really quickly. Then the person that buys it from us, then they make the real money. We try to make sure that happens. Our whole selling customers, sometimes we sell it to the end user, it depends on the property, but the majority are they go to the people who end up selling them to the end user either on terms or whatever. It just makes it more … It’s a built in clientele that way because they can keep going back for more. In an eight part series here, this is episode three, and the series is all about the result of sending out tons of offers and then what you do when the seller calls back or sells back. In this episode we talk specifically about, we send out offers and a lot of times people sign them and send them right back. There’s no talking or anything. They do it and they put their phone number in the signature box, we call them and close the deal. That’s the end of the episode. Okay yeah, bye. That would be funny, I love that. Go ahead fill us in because you’re on the front lines of this everyday. Well, so here are my things. Okay, so you open up the mail, oh my goodness. One of your offers that you sent out, they sign your mailer, they send great data. We’ve got into that before and more of that coming, but they accepted and sent it back to you, so great. My first thing is, are you still happy with the offer? You did not do that much work yet so you want to double check and do your due diligence, at this point, and make sure you want to act on this. Do you agree with me, Steven? That’s my thoughts. Yeah. I agree with you sorta, but I generally … If they sign it and send it back or when they do, and I haven’t tracked the percentages of this, I should because we’ve sent millions of letters out, offers out. I don’t know what the response percentage is but if I had to guess, and I’m making a pretty good educated guess here, about 25% of the deals that we do happen this way. They just sign it and they send it right back. My immediate response is great, I’m not negotiating anything. I think you do take a little different on this, Jill. We’re a little bit different too because some of the … We’ve been doing this for a decade so a lot of the things that we get back are from five or eight years ago, and we do have to seriously look at the price because it might be lower. Well, I’m not even thinking about that, Steven, I’m actually thinking, especially for people just starting out, this is your first mailer. Why don’t you pull up the property and make sure it’s something you want to buy. You know what I mean? Make sure you did everything right too and it’s not the side of a cliff. Yeah. No, I mean, we sent it. It ended up in your mailer. That actually was my next point. Absolutely, that’s a critical part of this stuff. You only send mailers out or offers out to a property that you’re pretty confident you’re going to purchase. The way that we scrub the data and look at the data set, and it’s stuff that we teach in our program right down to the last detail, you can only gather so much information about the property that you’re sending an offer on and so Jill’s right. The first you’ve got to do is get it in engineering and take a look at a Google Map and see if it’s something you actually want to buy. In some cases … I mean, you do that with anything everywhere. More often than not, way more often than not if fits all your criteria because you scrubbed the data. Sometimes, and there’s no way to tell from a censored data, it’s on the side of a cliff where there’s absolutely no access or you truly need a helicopter to get there, and we’ll pass on those deals. We’re spending time talking about stuff that happens a small percentage of the time. Make sure they own it. Right, they still own it. Just any of those details, you’re just confirming it all. Then basically you’re going to complete the deal and what does that mean. Well, you’re going to Create New Deed, you’re going to arrange a notary in the area and you’re going to send all the documents with a cashier’s check and a return paid envelope to get it back to you and get it recorded. It’s really easy and simple and awesome. If you, listener, are scrambling around trying to write all these notes, please just go to Success Plant and ask these questions. We have many, many, many existing members pipe into Success Plant everyday and … Are you laughing at me about pipe in? Totally. Oh, that is so … [inaudible 00:08:51] so ready to get a pencil. [inaudible 00:08:54] is a pencil. No, I’m joking. No, what I was going to say, Create New Deed, C-R-E-A-T-E.
Everybody in my life who cares about me thinks that I act older than I am. Do I say old man stuff and do old man stuff? Are my eyebrows too … Are they bushy? Is there hair coming out of my ears? No, not yet, thank goodness. Are my toenails too long? Do I wear black socks and stuff? Oh, I have seen that. I have to say, it’s refreshing. Maybe it’s the Midwest, that’s it. Half our callers are from the Midwest, everybody’s shaking their head right now in California. Well, I heard … Never mind. Listeners, you don’t need to write anything down. Just go to successplan.com and ask everybody there. Thank you, that was real nice. I was going to say, I’ll slow it down and spell everything if you’re writing it down. It’s not that long of a list. We’re stretching this episode out. If a guy signed your offer, check to see if this is really where you want to buy it and close the deal. That’s the whole show right there. Look for flaws, you know? Don’t look too hard. Don’t create flaws. People do that sometimes. I have this theory that people on the internet, a lot of people on the internet have this theory because I’m one of these people, would really rather avoid talking to people altogether. I think there’s a certain percentage of sellers that are like, “Aw, this is a great sale. I’m sending this out. I would way rather do this than blister with a real estate agent and talk to a real estate agent twice a week for the next six months.” I honor that. I’ll tell you the truth, a lot of years ago long before you joined the company, Jill, we would … I wouldn’t even call a seller at all, that was the norm. They would sign it, send it back, and I would contact the person who’s going to close the deal, either the escrow agent or the notary that we send to their house, and just say, “Hey, please contact the seller and make the arrangements to close it.” There would be no contact and they would do it and the deed would come back in the mail. I think that makes you cringe. No, I just do things differently, I guess. I’m here to say your way is better. We teach your way in our programs. I really think customer contact, now more than ever, even after just what I said, is just more important than ever. You might miss some stuff. What if this guy had six more like it that were fantastic and you never talked about it? All good points. That’s why we teach it your way. Write it down with your pencil. I should write it down with a pencil. Will you please back up and spell it for me really slowly? I actually have a yellow legal pad right next to me which is the funniest thing ever. I know. Why do we go for yellow legal pads? What is it about the stupid yellow ones that we kinda … It’s like old school, you need a yellow one. If I had my way, we would have no office supplies at all. Why do I even … I almost threw myself under the bus. Yeah, I was going to share. All right, I’ll share this real quick, it’s really kind of silly now. I am silly, I still like 3 x 5 cards. I know. See, I don’t tease you about that. There’s cards everywhere. You could totally get me back. All right, pencil, 3 x 5 cards, we’re done. We cancel each other out. Anyway, back to the topic here. One of the eight general responses that we spine from sending out all these offers is that they sign it and send it back, it’s the best one. I hope we answered how that usually goes. 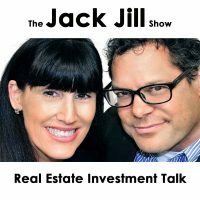 Join us in another episode where Jill and I discuss your all important success in property investment in life. You’re cracking me up. You buy cases of yellow pads and index cards and stuff. Were you holding back on that or did it just come to you, I just reminded you about it? I’m a frequent target of a lot of stuff like this by you and other people in my life, in my personal life and at least I get some respect at work. I think it’s now become, and I’m not sure … It doesn’t upset me or anything. Usually, when you tease somebody and they get really upset you just want to tease them more, but I don’t get upset about it, I laugh along with everybody but it just doesn’t stop. I’m sorry, it’s just meant to have fun. To answer your question, actually I don’t care, I think it’s kind of funny. To answer your question, Jill, no I don’t think there’s anything wrong with you. There’s nothing wrong with you, I was just having fun. Well, I knew that. I think you’re a beautiful person inside and out and I’m having the time of my life. I hope you are too. I am. What’s refreshing is I like your different perspective. I may tease you and I apologize but I like your perspective because it is very different and it’s sometimes and it’s really good so thank you. Oh, first one. Gosh, a fresh one. I think I might have been a little high in the [inaudible 00:15:03]. That’s what I’m thinking. Maybe between 10 and 25? Yeah, between 10 and 25 is good. I think I said 25. Did I say 25? I don’t remember. You can tease me about that, that is an old person thing. I don’t remember what I said four minutes ago. No. Do you know what’s interesting though is it gets hard to judge those because how many offers have we got trickled in even years later? I had offers trickle in from a long time ago. Wow, are they even looking at this area at one time? “My gosh, I forgot,” kinda thing. Sometimes I think I drive points home just too often. You can’t drive that point home enough. This business of selling offers, it just never goes away. You reap the benefits of it years and years and years later. It’s a great 41 to 45 cents spent, in my opinion. It is. Once you start this you could stay in this forever if you want to. Even if you actively send out mailers and just let these calls and letters trickle back over the years. You move on and you start writing books and you retire or whatever, you could still be doing this on the side and why not make some money this month, these offers came in. Right, that’s a great point. This is like an all through retirement kind of thing. With no work. Just let them just sit out there and then if they come back and you want to buy it, do it. You don’t have to out source. Probably with the exception of the decision, the processing of everything. We have a product coming out like that where we process everything for you. You find the deal, you send your mailers out. You find the deal, everybody agrees on a price and we take it from there. So yeah, I’m pretty excited about it. It’s not going to be released any time soon. It’s called … Right now around the office we call it Real Estate Company In a Box. You just open a box and go. Did you know any of this. Oh okay. You’ve been looking at the same database I am. Hey, let’s go buy some property.